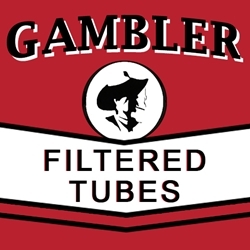 Gambler Filtered Tubes are made with the highest quality paper on the tobacco market. These filtered tubes burn so consistent you simply cannot make a better choice! Fill them up and get a faster, easier fill and better taste with an experience of a one of a kind smoke. Offered in both 100’s and the king size, Gambler Filtered Tubes are specially constructed to provide a smooth and even draw, allowing the flavor to stand out. Every Gambler filtered tube comes in 200-count boxes. Forget about retail stores, break out your finest tobacco, and start tubing today! Here at Smokers Discounts we’ve made it easy and affordable to buy tobacco products online. Call us for more details!